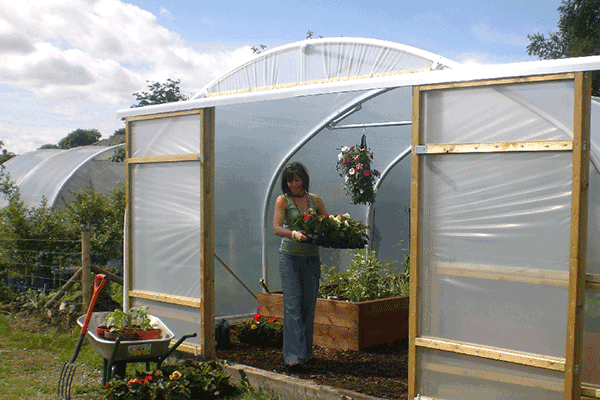 Traditionally, when choosing a First Tunnels Polytunnel the big decision for gardeners to make is “What size do I want?” But now, there’s another factor to take into account. “Which doors do I want?” It may not sound like an issue that warrants a lot of thought, but it’s a choice that will affect the day-to-day management of your Polytunnel. So it’s doubly important you make a perfect choice! So, what are the advantages of sliding doors over hinged? Simple, they save you space! Not having to leave an area for doors to open freely into the Polytunnel opens up valuable ground space for access and cultivation. Sliding doors also give gardeners greater ease of access and extra versatility when it comes to controlling ventilation. Throughout October, First Tunnels are offering a FREE sliding door upgrade – Save up to £200! More growing space, more ventilation, more flexibility BUT, NO MORE TO PAY! Simply select the FREE upgrade when placing your order and we’ll look after the rest. If no sliding door options have been selected, we will supply our hinged doors.